On the occasion of the 80th Anniversary of the Holodomor—the man-made, Stalin-era famine in Ukraine and adjacent Cossack territories in 1932 and 1933, during which millions died of starvation—His Beatitude, Metropolitan Tikhon sent a letter to His Beatitude, Metropolitan Volodymyr of Kyiv and All Ukraine, expressing “heartfelt solidarity” with the Ukrainian people. 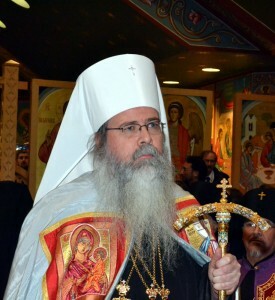 “The 80th Anniversary of the man-made famine in Ukraine, called Holodomor, which took millions of lives, is a tragic and painful anniversary,” Metropolitan Tikhon wrote. “On behalf of the Orthodox Church in America I convey to Your Beatitude and to the people of Ukraine our heartfelt solidarity. The cruelty and inhumanity of Holodomor have left deep wounds in Ukrainian society and in Ukrainian memory. Yet the Ukrainian people are not alone in their commemoration of the Holodomor. All those who treasure and honor the image and likeness of God in every man and woman join you and the whole nation of Ukraine in the sorrowful commemoration of the Holodomor. “The 20th century gives many examples of disregard for the value of every human life,” he continued. “Tragically, idolatrous ideologies of the 20th century were born in the context of European Christian civilization. Communist and Nazi ideologies sacrificed millions of lives on the altars of false gods. The text of the letter is available in PDF format.